Christmas came early for me when all of these much-anticipated books arrived at the library over the weekend. Really, their timing could not have been more perfect. The house is decorated, the Christmas cookies are baked, and the presents are bought and wrapped: all my holiday obligations have been fulfilled so now I can spend these dark evenings sitting back and reading. What could be nicer at this time of year? One Fine Day by Mollie Panter-Downes – I have had this on my TBR list from almost the first moment I heard about it but it was reading Panter-Downes’ wartime short stories recently that pushed it to the top of that list. A Country Life by Roy Strong – I adored The Laskett, Strong’s account of the making of his garden, when I read it earlier this year and have been on the look-out for more of his books since then. This is a collection of short pieces he wrote for Country Life magazine, arranged by season, and they look like the perfect bedtime reading. More Women than Men by Ivy Compton-Burnett – my first ICB, on Simon’s recommendation. Mrs Tim Carries On by D.E. Stevenson – Inter-library loan has been an amazing discovery for me this year and nothing has delighted me more than the access it has given me to D.E. Stevenson’s novels. This is the only Mrs Tim book that I have not yet read (which reminds me that I need to review Mrs Tim Gets a Job soon) and, of all the books I brought home this week, it is the one I am most excited about. Mrs Tim is one of my all-time favourite fictional characters. Mrs Queen Takes the Train by William Kuhn – I haven’t heard much from other bloggers about this novel (in which the Queen heads off to Scotland – without telling anyone – to visit the former royal yacht, Britannia) but it sounds whimsical and fun. There have been some excellent novels done using the royals (or lightly fictionalised versions of them) as protagonists – The Uncommon Reader, The Queen and I, and Freddy and Fredericka are my favourites – so I am interested to see how this compares. Hark! A Vagrant by Kate Beaton – a collection of Beaton’s wonderfully clever comics. Though not pictured here (because it is apparently impossible to find a cover image online for it and I was too lazy to take a photo yesterday), I also picked up All The Books of My Life by Sheila Kaye-Smith, having been intrigued by Simon’s excellent review of it earlier this year. I am totally green with envy. Love your haul. Something that may interest you about the cover of Fletcher’s End is that it depicts a house which was lived in at the time by one of D E Stevenson’s sons. Very interesting. Thanks for sharing that, Geraldine. I keep forgetting what I’ve requested from ILL, and our system doesn’t allow me to check on the status of requests, so it’s always a pleasant surprise to be notified that something has arrived! I have a volume of Molly Panter-Downes’ war-time writings waiting for me, which I requested after reading your review the other day – and which I need to pick up this week since they’ll be closed for Christmas. This will be my first time reading her work. How annoying but, at the same time, exciting. It is sometimes fun when books show up unexpectedly. I have Panter-Downes’ London War Notes in transit to me right now and I’m sure we’ll both enjoy it! I want to be a borrower at your library, Claire, it seems to stock way more titles to suit than mine does. Lucky you! Jamie’s Great Britain cookbook is lying around in the kitchen but the rest of my holds are in suspension mode until after the holidays. You are so much more prepared than we are here…there is not a baked cookie in sight! Most of these are inter-library loans, Darlene, so it is less about VPL being wonderful than Victoria, West Vancouver, Gibsons, etc being fantastic! As for Christmas preparations, this is when my tendency for obsessive organization really pays off. Others may run about at the last minute but my family is calmly laid back, enjoying the peace our months of planning has earned us and looking forward to our hassle-free Christmas. We are obnoxiously smug. I am really looking forward to One Fine Day, Audrey, since everyone seems to adore it. I loved One Fine Day and won a copy of Mrs Queen, which was a cute read. I borrowed Ten Days of Christmas by G.B. Stern, Mrs. Miniver, Map of Another Town by M.F.K. Fisher, The Secret Keeper by Kate Morton, and Last Rituals by Yrsa Sigurdardotter. Those were last Friday’s haul. I’m reading Three Houses by Angela Thirkell from the Friday before’s bunch. There will be a couple more waiting for me this Friday! Yikes! I better get going. Do you know, I have still never read Mrs Miniver. I used to be scared off because I thought it would be like the film but now that I know it’s not I really do want to try it. Mrs Queen Takes the Train sounds like a good one to me! I’ve added it to my TBR list! Wow, this is an amazing haul! I’m looking forward to your thoughts on all of these. It is definitely my best loot in a long time! I’ve heard good things about Hark! A Vagrant. Enjoy! Very nice haul. Mrs. Tim Carries On is so immediate, since the events were apparently based very closely on DES’s wartime diaries. What I picked up this week. I reached the top of two long hold lists: The latest books by JK Rowling and Janet Evanovich. But there’s something called Christmas coming up, which somehow gets itself in the way of reading. I am so, so, so excited about Mrs Tim Carries On, Susan! Now even more so, knowing that it is based on her own diaries. Lovely choices. I have read and reviewed “Mrs. Queen Takes the Train”. It is great fun. I am sure it will help fill the dark nights with a little light. I really must get on to the Mrs. Tim books. And Roy Strong sounds like my kind of a guy. I see that my library has a host of his work for my reading pleasure. Yea! Yes, you must try Mrs Tim and Roy Strong! I love them both and if your library has lots of Strong than there is no excuse not to read him. If they have The Laskett, I would particularly recommend that. it is one of my favourite books from this year’s reading. Oh dear. My library doesn’t have The Laskett. I will try for an inter-library loan and start in on A Country Life. Mrs Queen Takes the Train is on my check out list. It sounds like a great story. Enjoy your loot! Oh, what a wonderful selection of goodies! I do hope you like the Roy Strong book after I’ve blathered on about it so often! At Christmas I always dig out one of my lovely books-without-words, a book of paintings by John Goodall, this one called An Edwardian Christmas, it’s a delight from beginning to end! Goodall did a number of these books, do hunt them down … The Story of an English Village is another lovely one of his. Originally for children (or the child in us all!) these are delightful books which tell a story but without any words, just his wonderful paintings. I am sure I am going to love the Roy Strong, Margaret. I’ve already dipped into a bit and it is just as interesting as I had hoped it would be. I remember John S. Goodall’s books from my elementary school library so it is delightful to hear that you’re reading (or looking) at An Edwardian Christmas. How wonderful festive! I’m loving the cover of A Country Life and it sounds like a good read. Enjoy your loot! The cover is a very, very bright yellow and I am finding it a very cheerful sight on my bedside table! That’s a fantastic collection, especially the VMC Mollie Panter-Downes. Your library seems much better than mine – I doubt if any of those would be available, even as requests. As much as I adore the Vancouver Public Library, most of these books were shipped in from around the province so those libraries are the ones that deserve the credit. Still, it is wonderful to have these connections in the inter-library loan system and I am very thankful. I can completely understand the need to start 2013 with a fresh slate, Alex. Good luck! Oh, Claire, what a haul! So much to delight! You already know that I love One Fine Day, More Women Than Men, and All The Books of My Life – I really, really love all of them, rather more than most of the books I say I love. And Mrs. Queen has caught my eye once or twice – I’m keen to find out what you think. And of course I love Hark a Vagrant, and have added the book to my wishlist. What riches! But I confess, I am most intrigued to hear what you think of ICB. I was wondering where you were – if there were ever a Library Loot post I expected you to comment on, this is surely it! You’ll be happy to hear I am planning to finish my last two (!!!) 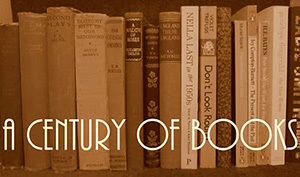 books for A Century of Books and then I have a date with ICB. I am as eager as you to find out what I think of her! Ha! Yes, it would be very remiss of me not to comment on THIS one – also pleased to see, further up the comments, that you’re tempted by Mrs. Miniver. Do be tempted! That is a mighty fine bundle of loot you have, Claire, with some titles I’ve been meaning to read. First on my list would be “A Country LIfe”. Today, I came home with Miss Read’s Christmas: Village Christmas and The Christmas Mouse, Marilyn Robinson’s When I was a Child I Read Books, which I have been wanting to read since it first came out, and a neat little book about gifts you can make in a jar. First, more baking to do. Good luck with your baking, Penny! It sounds like you have some lovely holiday reading to look forward to once you’re done. One Fine Day is very good; Mrs. Queen I found amusing (but I liked An Uncommon Reader better). Your library system sounds wonderful; I quite envy you. My library system IS wonderful though this week’s loot is mostly imported from elsewhere via inter-library loan. Still, that fact that all these books can be brought in at no cost to me is a source of endless amazement and I am deeply thankful. I’ve been following the Library Loot meme for some time. I don’t think I’ve commented previously. I’ve enjoyed it and found it very interesting and wondered how I could join in. So I read through your instructions and found Mr Linky. Now I’m happily able to share my detectible library selections along with making a note for myself in my commonplace book/blog. Thank you for your blog and the Library Loot meme, I think they are excellent. Thanks for joining in, Diane, and for commenting! As a non-Christian the Christmas period can be a challenge consequently a per-festive library trip is essential and makes a big difference in being able to walk out with an arm full of books as a panacea to survive the holidays. As I’m on an Alberto Manguel trip right now so I got his excellent translation of “Ports of Call” by Amin Maalouf (Inter-library loan), “The Uncommon Reader” by Alan Bennett (heard him read this on BBC4 – excellent) , Sarah Winman’s “When God was a Rabbit” “Reading Pictures – A history of Love and Hate” by Alberto Manguel and “The Secret Supper” by Javier Sierra translated by Alberto Manguel and finally I will re-read my school-chum Neil Jordan’s “Mistaken”, an excellent story worth a further visit.